In our effort to build a comprehensive picture of animal research statistics worldwide, our latest post is on the recently released (permanent link) statistics for Ireland. These are compiled by the Health Products Regulatory Authority of Ireland (HPRA). These statistics are produced in accordance with EU Directive 2010/63 which regulates animal research across EU countries. The restrictions and standards set by the Directive are expected to enhance animal welfare and ensure that animals are used in studies only when their use is strongly justified and following independent assessment. The Directive firmly anchors in EU Legislation the 3Rs, i.e. Replacement, Reduction and Refinement. The total number of animals used for the first time was 224,249 in 2014, down almost 20% from 2013. The total number of procedures was slightly higher at 226,684. These numbers include all vertebrates and Cephalapods, but do not include invertebrates like fruit flies or nematode worms. Unlike countries, like the UK and US, basic research is a much smaller portion of overall research (15%) in Ireland whereas ‘Toxicity and other safety testing’ is larger, accounting for over 61% of all Irish procedures on animals. 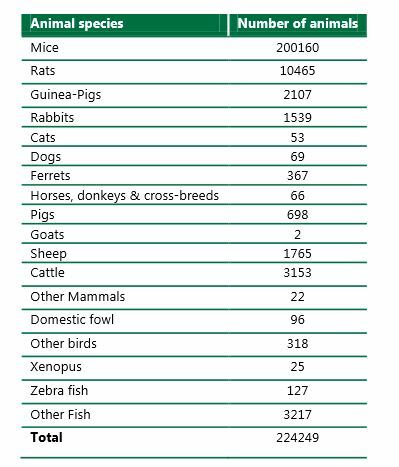 95% of animals used in research were rodents (mainly mice). Dogs and cats, combined, accounted for only 0.05% of the total number of animals, and no primates were used at all. The full Irish statistical document provides information on the source of the animals, the different types of research (broken down in different ways, such as by body system) and the severity – providing a good picture of what research goes on in Ireland. The HPRA also advises that in respect of the HPRA’s 2013 data, it would be unsound to directly compare this data as it is only the second year of a new reporting structure to which reporters are getting better acquainted to the changed reporting requirements and provisions required. Extreme caution should be applied therefore in any attempt to draw comparisons to previous years’ figures. We look forward to seeing another high quality statistical release next year. Posted on July 21, 2015 by EditorPosted in News, Outreach NewsTagged animal research in Ireland, HPRA, Irish animal research, Statistics.